We booked tickets online during peak period of Summet and at sunset. My son uses a wheelchair so we got priority access and there is a lift to second level. The kids loved the light show and the carousel out the front. Having seen this before on my own, it was pretty incredible to bring the family. We pre-purchased tickets online, but still had a bit of a queue for the lifts, but not as bad as those who had yet to purchase tickets. It wasn't a busy time of year when we went so there were next to no crowds, except those lining up for tickets or lifts. We had the perfect weather and took the lift all the way to the top. There are two lift rides, one gets you about half way (It has two stops, the first then the second floor) - the second floor is the point where you climb the stairs to. The second lift takes you to the top……. We took the lift all the way to the top, and when we we left, we stopped off at the second floor and walked down to the bottom from there. Of course we had champagne at the top, (yes expensive but hey you're in Paris!) and the views are incredible. Lots of information and things to look out for. Very safe, but I don't think a toddler would enjoy or appreciate it as much as a 5yr+ child would. Mind you if they are asleep in a front/backpack, seize the moment and head on up. We headed off for some food, to Cafe Gustave afterwards, a short walk (north-east) of Eiffel Tower. The grounds surrounding the Eiffel Tower a great for kids to run around. However it is full of tourists and thus the beggars, and pickpockets. Just keep your wits about you and try not to look too foreign or you will be targeted. A must do but hard with tired kids! We visited the Tower between Christmas and New Year 2014. We thought the crowds wouldn't be too bad but the line snaked its way around under the tower for ages. So, I did the line waiting and husband went walking with the kids for an hour or more while I waited. You can get tickets in advance and this is really the best way to go with kids. Everyone who had tickets already were getting in right at the beginning of the entrance line (which is a separate line you join after buying your tickets). In short, if you are going with kids - BUY ONLINE beforehand. Also, you need to get them at least 2 days before online as I had tried the night before and it wouldn't allow me to buy for the next day. We went up to the first floor only and walked around and bought some hot chips and a drink - both quite expensive. You can take food up so if you are on a budget I would do that instead. It is nice sitting there and looking at the view and eating. The kids can move about enough without getting in the way of other people and it is very safe for kids. 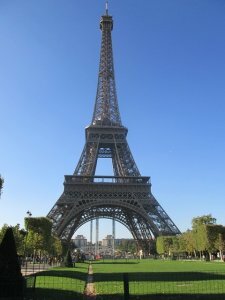 There is a section on the Eiffel Tower website too aimed specifically at kids. It has some games and things which might interest your kids and you can do before or after you go. A booklet can be downloaded (http://www.toureiffel.paris/en/have-some-fun-during-your-visit-.html) and printed as well and is very good for kids over the age of about 8 or 9. Younger ones could use it with a parents help. I think that the Eiffel Tower is one of those bucket list destinations and we went there not because I thought that it was a wonderful place to go with kids, but because I wanted them to experience it and we wanted to see it again too. They were bored after about 10 minutes really!